There are a lot of steps to this pie, but it really is easy. Please ask me if I've confused you! Make lemon curd, prepare crust, mix ice cream with curd and freeze overnight. 1. Stir together sugar, butter, lemon juice and lemon zest in a large heavy saucepan over medium heat, and cook, stirring constantly, 3 to 4 minutes or until sugar dissolves and butter melts. 2. Whisk about one-fourth of hot sugar mixture gradually into eggs; add egg mixture to remaining hot sugar mixture, whisking constantly. Cook over medium-low heat, whisking constantly, 15 minutes or until mixture thickens and coats back of a spoon. Remove from heat; cool completely (about 1-2 hours), stirring occasionally. Graham Cracker Crust: I crushed a LOT of graham crackers and mixed them with enough melted unsalted butter to make a nice crust in my pie plate. I didn't measure! Let the ice cream sit on the counter about 10 minutes. Spread ice cream on graham cracker crust. Layer with lemon curd, repeat then use a spatula to combine in swirls - being careful not to break the crust or let the mixture melt. I used my hands to do all of this. It was too difficult to spread everything with a spatula, it worked though! :) I got everything all mixed in well! Next day before serving: Make meringue and final prep on pie. Step 1: Remove the pie from the freezer and let sit on counter while you make the meringue. 1. Prepare a double boiler: Choose a heat proof bowl that will fit comfortably in one of your pots then set aside. Fill the pot with water, but not too much, you just want the bowl to sit above the water. Bring pot of water to a boil while you prepare your meringue. Once it's boiled, bring it to a simmer. 2. Combine egg whites, sugar, maple syrup and vanilla in your heat-proof bowl; beat mixture at high speed with an electric mixer until blended, about a minute. Place bowl over simmering water, and beat at high speed 5 to 7 minutes or until soft peaks form; remove from heat. Use immediately and spread on the pie. Make little peaks in the pie for decoration if you want. 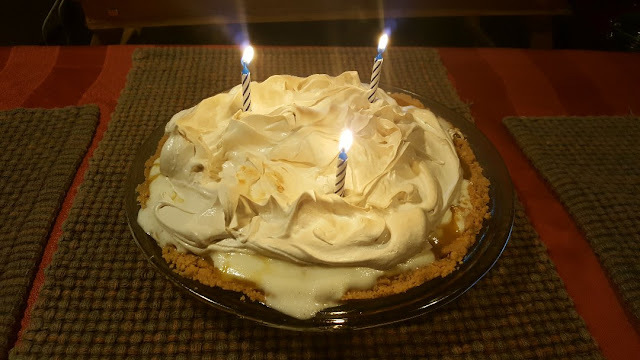 **at this point I put the oven broiler on high then put the pie in to brown the meringue, it took about a minute and a half without the whole pie melting!